I’ve received lots of requests to blog about potty training … but it’s taken me a really long time to sit down and write this post. The road of potty training my son (now 6) has been long and bumpy … and not over yet. This post is part of the “We Get It” parenting series coordinated by The Golden Gleam. I wanted to be able to share our experience of how sometimes potty training is not as easy as some parenting books, psychology classes, blog posts, and other parents make it seem. I … as a parent AND a child psychologist “get it”. 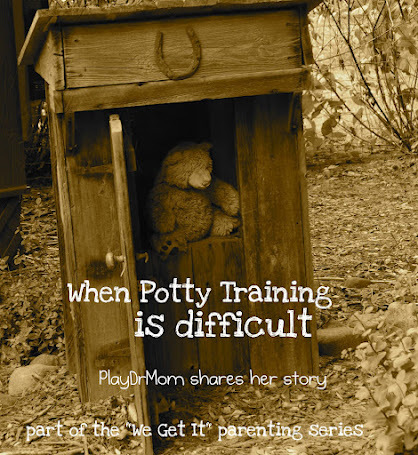 But first, let me share my daughter’s story … what I think of the typical potty training story … the way I would explain to parents wanting to potty train children. At 2 1/2, my daughter Honor (now 3), started to show interest in using the potty … we greatly encouraged her and cheered her on for even wanting to sit down on the potty and try. During this time we also read lots of books on potty training (resources listed at the end of the post). We also watched 2 DVDs on potty training. Her favorite potty training DVD was (and still is … she requests it frequently after she has a rare accident) … POTTY POWER. I highly recommend this DVD for any child that is developmentally ready for potty training. (But, I do warn you that the songs get stuck in your head … “I’m proud to wear my underwear, I’m proud as proud can be!”) POTTY POWER is especially wonderful for little girls that love princesses (like my own Princess Honor) because within the DVD is a video vignette of a Princess who learns to use the potty. The other DVD we watched was Elmo’s Potty Time … which is also very fun and a great resource. 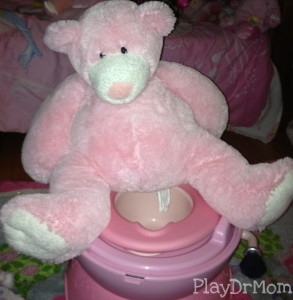 We also role-played potty training with her dolls and stuffed animals. It was so cute to watch her independently do this type of play and praise her “babies’ when they were successful! Every time she peed or pooped in the potty she got TONS of verbal praise and got to pick one fuzzy/pom pom to put in her Potty Points jar. (I’ll talk more about the jar when I get into Henry’s story later). During that week she had a few accidents, but got the hang of it quite well. After those days, she stopped wearing diapers and only wore underwear (princess underwear preferably, of course!). She also started being dry all night. 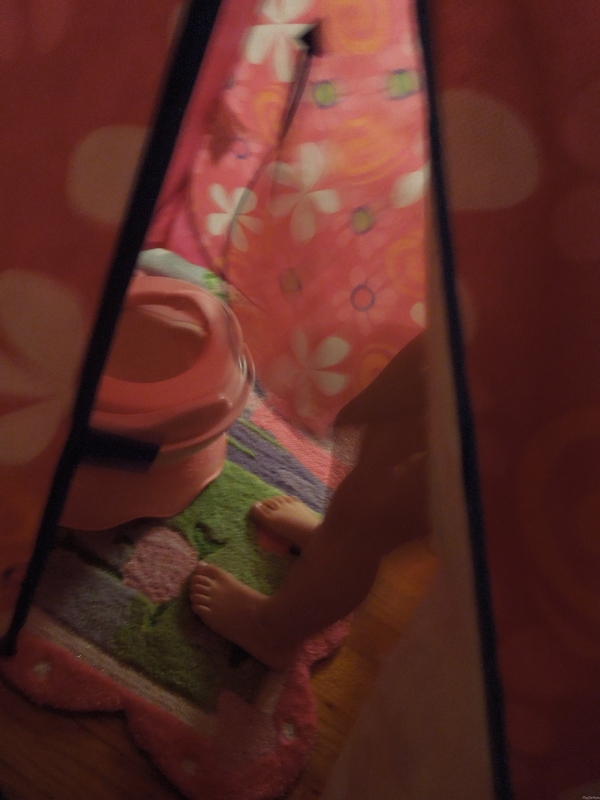 Within the month, she was completely potty trained … she still (now several months later) has the occasional day or night time accident (maybe once a month), but I still would say that she has mastered potty training! Henry never showed any interest in potty training. When he was 2, we talked about it a bit, read some books, got a little potty … but he wasn’t interested. By the time he was approaching 3, I knew I didn’t want to push the matter. I was very pregnant with my daughter and knew better than to force toilet training with my son when we would be going through a big change within the family. My daughter, Honor, was born in May and Henry was to attend preschool in the fall … I really wanted him to be trained before the start of school (even though, luckily, it was not a requirement). But, he still showed absolutely no interest during that summer. It was also I difficult time for us as a family because both my newborn daughter and I contracted an infection in the hospital when she was born. The infection affected me at least once a month for the next 2 years and at times gave flu-like symptoms, exhaustion, and sometimes required IV antibiotics. Anytime Henry made any positive steps towards toilet training … he would regress whenever I became ill. Our schedules would get turned upside down … giving the kids very little consistency and making regularity of training impossible. (I didn’t realize the impact all of this was having on his potty training until MUCH later.) Having frequent accidents was also a way for Henry to gain my focused attention when I had very little to give. I tried very hard never to scold or belittle him for his accidents, but I know he could sense my frustration. This never helped. We continued to struggle using positive reinforcements and tracking calendars … every trick in the book I knew and recommended to other parents I met through work who were struggling with toileting issues. I started off using a Potty Points jar (it’s been extremely successful for many clients of mine, for many different behavior issues … see my post on Promoting Positive Behaviors). Basically every time Henry used the potty, he received a fuzzy/pom pom to add to his Potty Point Jar. On the side of the jar I made marks, so that when the jar was filled to certain levels he would obtain a reward (like a trip to Toys R Us, Chuck E. Cheese, etc). He would have some short-term successes, but never anything that lasted. After trying the Potty Points jar for a very long time, we started to use a tracking calendar/sticker chart. The calendar helped me keep track of how many accidents he was having daily/weekly/monthly … and whether or not there was any pattern to his incontinence. If Henry had a dry day, he would receive a sticker on the calendar. We developed a reward key … if he had 3 dry days in a row he earned _____, 5 days = _____, 10 = _____, etc. Again, he would succeed for a few days … but was never able to keep dry successfully. After seeing the specialist, Henry was officially diagnosed with enuresis (the diagnostic term for day or nighttime wetting). The doctor confirmed what I thought was possible; Henry has an overactive bladder and that the issue will most likely resolve itself as he develops. I walked away from the appointment feeling horrible for all the times I inferred to Henry that he SHOULD be able to control himself … but I also felt a HUGE sense of relief … there was NOTHING we were doing wrong. His body was just not ready yet. Even at 5, he wasn’t ready. We also walked away with a prescription for Ditropan. I had LOTS of mixed feeling about trying a medication to help control his bladder. I believe(d) that when his bladder was ready, it would be ready … and I’d rather not medicate. But we gave it a try one day … just to see what would happen. It KNOCKED HIM OUT … a kid whose usually VERY active couldn’t even keep his eyes open at a family outing. So, that was that. We made the decision that he’d be ready when he was ready. And, that’s where we’ve been ever since. It’s been one year now. Henry was able to have an extremely successful year at kindergarten … potty training and otherwise. He only had one accident at school throughout the whole year. He does occassionally have accidents during the day … but only at home. And he isn’t ready to be dry at night. One trigger that we found out is constipation or irregular bowel movements. Constipation can cause the bladder to become smaller and harder to keep from emptying quicker (hence not being able to make it to the potty on time). When Henry starts to have a few accidents in the row, we now know need to ask him the last time he had a bowel movement. Henry has some mild sensory issues … he is hyposensitive and seeks sensory input to keep himself regulated. Therefore, being wet or smelling like urine is not uncomfortable for him … in fact, it’s the opposite (this is something that took me quite awhile to understand since it is quite an UNcomfortable feeling for ME). He also seeks sensory input from drinking frequently … which, of course, exacerbates the problem. Helping increase his sensory input in other ways has helped these concerns. Henry also has inattention issues … he gets easily distracted and does not focus on what his body is telling him … especially when he doesn’t want to stop what he is doing (like playing). Having him take breaks while playing assists him to not have accidents. As for his nighttime wetting … Henry is a very deep sleeper, but has difficulty falling asleep. Using alarms or waking him during the night has not worked for us. We have found that for him (and us) using overnight diapers works best. And we will stick with the plan that when his body is ready he’ll stay dry. His sensory and inattention issues may or may not resolve themselves as he grows older … just as his overactive bladder may or may not need to be treated at some point and time … but at this point, and with the NEW pediatrician’s advisement, we will just wait a see. A final note … Make sure that the child is DEVELOPMENTALLY ready. This does NOT mean a chronological age … many children due to their physical, cognitive, or emotional issues are not developmentally ready. Pushing potty training, reading stories, and watching videos on the subject may make the child feel bad about not being able to successfully master the task. And, in turn, the child becomes resistant to attempting potty training. I recommend that if a child doesn’t appear to be ready … check with your pediatrician to rule out any physical issues, seek advice from a child therapist for behavioral or emotional concerns, think about what’s going on in the child’s and family’s life, and wait for your child to be ready. How my twins potty trained themselves from CAUTION! Twins at play! Nice to know all this info, thanks! I thought Nico was late on this, since he’s turning 3 monday, but daytime is pretty much potty trained, rarely an accident. Night time, he wears a diaper, since it’s hot and he drinks during the night. Once summer is over we will see for night time, he was doing well for dry diapers several times a week before summer hit. Thank you for this! My daughter (who is 3.5) has had a lot of trouble potty training. I’m hoping we have finally got it down, but generally she’ll be good for a month or a few weeks and then start having accidents 3 or 4 times a day. She’s pretty smart, so I wasn’t sure what was up. It was really frustrating, and I got pretty mad (but tried not to show it) at times. She still won’t go potty when it’s naptime or bedtime (she has to wear a pullup), but other than that she is doing ok these days at home. When we are out and about it’s hard because it’s a new place or she is distracted by the fun things going on. But we did make it through a trip to Grandma’s for two days with only one accident at the very beginning, so that is definitely progress. It’s nice to know that I’m not the only who has kids who keep having accidents (my mom kept saying “When they get it, they get it so fast and have no more accidents…so I felt like I was doing something wrong). Thank you for sharing your story. Your son sounds EXACTLY like my oldest daughter. 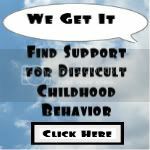 Can you provide some information regarding the sensory issues and the attention issues? My daughter totally understands potty training and gets very upset when she has an accident, but she can’t seem to help it. We have ruled out any medical problems, and I can see she has attention problems just from watching her throughout the day. As for the sensory, she is constantly putting things in her mouth and is always very concerned about how her clothes feel against her skin, so I feel like that could be a link somehow that I’m not aware of. She is 4, and this is very distressing for her and for myself and my husband. Any input or resources would be amazingly helpful! Thanks for this post! Erin … I would ask your pediatrician for referral for an Occupational Therapist (OT) to get an assessment for the sensory issues. I would also talk to her doctor about the attention issues … but at her age you might just want to see if she “grows out of it” as many young children have difficulty paying attention. If she goes to school, they also might be able to provide you with referrals. In the meantime, you can add more sensory play into her day (like touch & feel books and games, messy art activities, as well as having a sensory bin available for her to play with). There are TONS of ideas on Pinterest and blogs … one great one is Growing a Jeweled Rose … if you don’t already follow her! Both of my children were pushing 5 years old. Horrifying nightmare. My youngest finally caved in when he was bribed with a playstation. My daughter the oldest I spent the ENTIRE day in the bathroom with her on the potty. I was near hysterics as she sobbed and cried. Finally in an inconsolable cry fit she accidently peed. Stops crying and looks up and says ” that wasn’t so bad” Truly my most horrible moment as a mother and it makes me want to cry every time I think of what I put that child through. I honestly don’t know how I could have done anything different. Maybe it was just me. This post is perfect timing for me! My son is 18 months and he just started showing some signs of interest (indicating when he’s gone potty in his diaper, interest in us going potty, talking about potty, etc.) so we encouraged him, bought a seat, and had a couple early successes. This is a good reminder to me to follow his lead and not push if he decides to step back. He’ll get there when he’s ready. Thanks! His sister at 3 decided she wanted underwear and she did well, then would ask for diapers for a month then be trained (did it a few times-sometimes because grandma didn’t trust her and gave her a diaper and sometimes school) She still has trouble at night but when I came home with princess underwear and said no more diapers during the day if you want these… she decided she was trained. It helps that she is more competitive. She sees another friend use potty she wants too. The only issue we really had is when her brother would have a fit being asked to go potty so she started to too. The summer of forced potty has gotten her over that. She still has an accident every now and again but she is better and likes being a big little girl. The best thing about this post is: MOMS you are not alone. It is not that you are a bad mom, each child is VERY different and you are doing a fantastic job! Tiff … Thanks so much for leaving your story and great comments! Thank you ALL for leaving comments! It means SO much to me that sharing our story can help others in some way … even if it’s just to feel that you are not alone! Thanks for this post! My sawyer was a hard one to potty train, too. He finally got it at around 4.5 years old. And he actually sounds a lot like your son in regards to the sensory issues. (He never cared, either, about sitting in a messy diaper.) I’d love to talk with you more about that sometime. Great post! Our daughter trained easily for urination but, struggled mightily with bowel withholding until the age of four. Despite endless Google searches and countless calls to our pediatrician, none of the recommendations produced the desired results. Adding to the frustration was the lack of printed material dealing with this particular potty training problem. Introduced to a book available on Amazon.com. ” I Can’t, I Won’t, No Way!” A Book for Children Who Refuse to Poop. Written entirely from a child’s perspective…it went a LONG way in breaking down our daughter’s resistance. Highly recommend it for any household with a “poop refuser”! Thanks for the great suggestion! I’ll have to check that book out! I just now read this post. Thanks so much for sharing your story. Potty training was not easy for us either. Thank you for this post. My son is 4.5 and unfortunately we didn’t know any better and pushed the potty too much when he was younger. Now he will have NOTHING to do with the potty. I’m so worried but it is at least reassuring yo hear from other parents whose kids were late to the potty party.